Summer is officially here and it’s time for me to finally get around to writing down some of the things I need to remember. Hopefully this list can help you too in your quest for gardening perfection (pssst….it doesn’t exist). Replace your strawberry plants every few years. I’ve heard this said over and over but I’ve always kind of been like “yeah, whatever, they are perennials.” Well, I finally have to admit that I was wrong. Every few years those plants drop in production…like a lot. 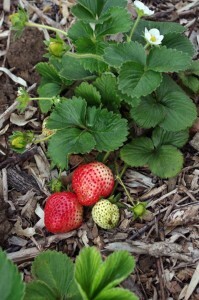 Last year we harvested 35lbs of strawberries from our little 4’x10′ bed. Quite impressive. This year? I haven’t added it up yet but I’ll be surprised if we broke 5lbs. The berries this year are also substantially smaller than last year as well. These plants gave us a good 3 year run but even fertilizing didn’t help use out and we’ll need to replace them next year. The question is what varieties should I replace them with? Do you have a favorite strawberry variety with outstanding taste (#1) and production (#2)? Update: While I was writing this it came to my attention that while the harvest is lower it has been made even more low by Squeak the Super Dog who has found an undying love for the taste of strawberries. This year we tested the waters selling plant starts. The tomatoes were the biggest hit by far. We only grow heirlooms and are picky about the varieties – only choosing those that grow well for us. While I thought Stupice – the heirloom tomato’s answer to a fog-tolerant Early Girl – would have been a big hit, it was the Black Krim and Hillbillies that stole the show. We actually sold out of Black Krim and 90% of our Hillbillies before we even started tabling at Moschetti Coffee. We also got a lot of requests for red beefsteak tomatoes so we’ll be looking at including more of those – probably Brandywine, Italian Heirloom and more Mortgage Lifter plants. Paste tomatoes were also a popular request so I’ll need to include some of those as well. Next year I hope to increase the amount of plants we grow substantially. We will also be using real plant pots as the red cups tip over too easily. Unfortunately it means we’ll have to charge a bit more to cover the cost. As much as I LOVE hot peppers I should probably have realized that the general populace doesn’t share that love with me. While I was able to sell most of them, the sweet peppers sold out pretty quickly. Also, I’m hoping that next year the Anaheims do better so I’ll actually have some of those to sell. We had a problem with direct seeding melons, watermelon, cucumbers and some of the squash. Most refused to germinate. After doing some investigative digging I found that the issue for some was that something was eating them right when the root would start to come out. So for those I ended up germinating them in the greenhouse and planting them as soon as they were up so as not to have issues with being root bound. However, the Bidwell Casaba melon seeds I couldn’t even get to germinate in the greenhouse. I tried pots outside. Still no go. I ended up going through 4 packets of seeds and after planting every single one I only got 2 plants to show for it. They weren’t being eaten, they just weren’t coming up. So I decided to try a few other varieties of melon and every single one I planted came up within just a few days. I’ve planted Bidwell Casaba before and had great luck so I suspect there was something wrong with this year’s batch. Next year I plan to start seedlings about a week before the earliest date I can put them in to avoid this mess again. Our garden is going gangbusters right now. Plants are all huge, producing a ton and we aren’t having any disease or pest issues. Last year we had a pathetic harvest due to being skimpy on the manure spreading. This year we tripled the amount of manure we put down and what a difference it has made! The only patch of ground that we didn’t amend very well is where we have beans planted and the difference between that patch and another patch in another location that was planted at the same time is very notable. We can barely get down to the walkways because the uber-happy squash has taken over everything, including the pathways. We need to grow fewer squash next year because of this and also because they seem to want to take over all the other plants. Plus I have absolutely no idea what we are going to do with that much squash. I figure this year will just be the year where we determine what our favorite varieties are and then next year we will reduce the amount we grow. So far we know we will be growing Howden pumpkins and Trombocino squash. What I really like about the Trombocino is that it’s eaten like zucchini but the majority of it is seedless except for the bulb at the very end. This means that if one gets away from you it is still just as edible as it was when it was smaller. It also makes fantastic pickles because it’s less likely to get mushy in the canner. Of course it will be awhile before we can choose the winter squash variety we like the most (besides the pumpkins). We harvested our very first June tomatoes this year. Usually we don’t get tomatoes until the end of July – mid-July at the very earliest. We’ve even got tomatillos ready to go. It’s been unseasonably hot the last month or so. While our normal weather pattern is around the upper 70s with morning fog, we’ve been getting a pretty consistent stream of upper 80s to 100s. It finally cooled down to decent upper 70 weather this week but it was pretty brutal for awhile. Because we weren’t expecting it, some of the harvest got away from us and now we’re scrambling to process stuff. I processed a dozen quarts of zucchini pickles on Friday. I also processed 36 8-oz jars of apricot jam, 6 quarts of halved apricots and 2 quarts of apricot syrup. I think for now I’ll stop here. Watch for Volume 2 later in the season. very encouraging to hear your results this year! any tips on the manure? is this from your chickens and/or something you’re buying? how is the hugelkultur experiment going? We just use the manure from our own animals. I try to avoid commercial manure because of the drugs they give animals, unless I can find an organic farm. So far I’ve been a little less than thrilled with the Hugelkultur bed. My tomatoes seem to be suffering from blossom end rot in just that bed even though we gave them crushed eggshell like all the other plants. The watermelon pretty much failed. The peppers are doing good though. What are the path sizes between your beds? I’m planning a new garden right now and trying to figure out what the least amount of space between can be, but still be able to get thought! Some are 2′ and some are 3′. The 2′ ones are too narrow to bring down a cart but OK for a wheelbarrow. Great information! We’ve just dug for our first Hugelkultur bed, so I find your comments very interesting. I had a similar problem with strawberries, only because I couldn’t pull the runners last Fall due to a knee injury. They produced this year, but not as well as I had hoped and were much smaller than last years crop. I read a really great tip that I’m going to try. The suggestion was to plant a small strawberry bed every year so there are always 3 beds. 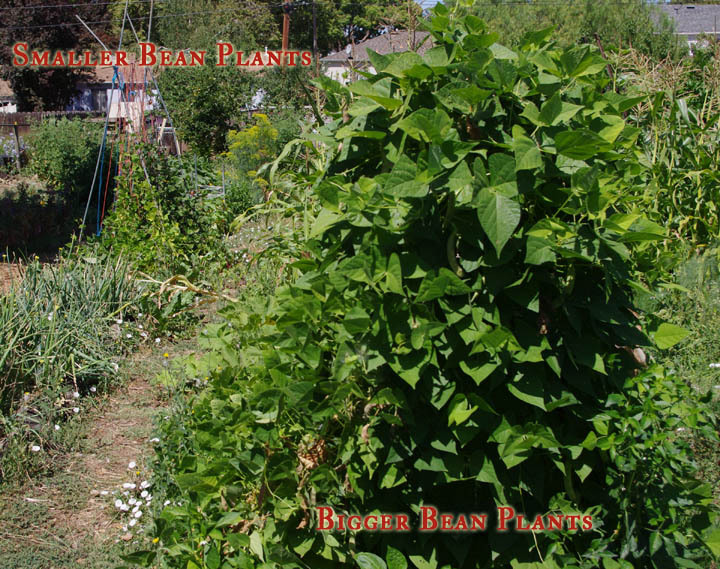 That way you get the huge berries from the year old plants and whatever the 2 and 3 year old plants produce. When you finally plant the 4th bed, you till over or smother the oldest bed when picking season is over. It’s never a big deal to start that new bed if a small one is planted yearly. Great info! We got 4 tomatoes from you from Moschetti. The stupice was by far the earliest producer, and we love it. The Isis and indigo apple are also doing really well. Would love to see the stupice again next season! Thanks for the vote! Yes, we will do Stupice again. I love the power of poop, and the independence from commercial fertilizer. Your garden’s looking great! I have all but given up direct sowing seeds. Carrots are the only thing I start directly in the ground now, and even then I sow too many, and then over sow any areas that look sparse. I tried direct sowing some squash, and sunflowers earlier this spring, and between the voles, birds, and gophers, they took the lot (insert angry farmer face here). 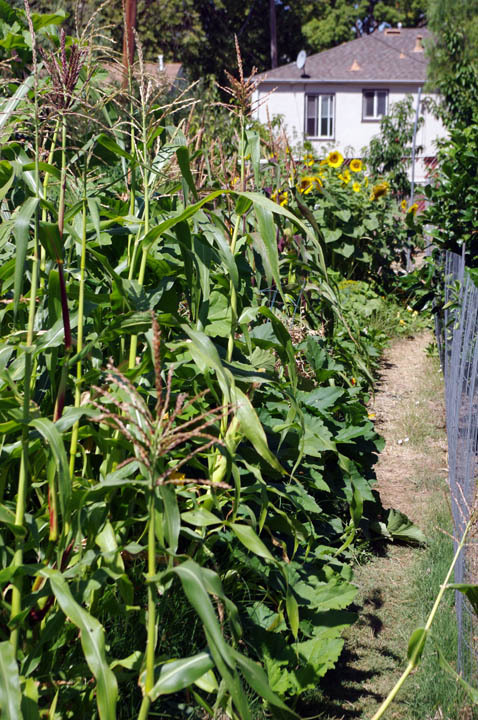 The transplanted ones are fine, but the seeds just seem too attractive to a number of creatures, and the row covers only protect from the aerial seed-thieves. I should have known better after our entire direct-sown pea crop was obliterated a couple of years ago, but I’m stubborn! For hot peppers, for us, the Jalapenos, and Padrons are the most popular, and honestly, even for us they’re the two varieties we use the most of in the kitchen. Anaheims and Anchos are also pretty popular too. Brave crazy-hot pepper aficionados though seem to be quite scarce. Strawberries…I’m pretty happy with Sequoia so far. Overall, though, I like a big flush of fruit in the spring, to pair with things like rhubarb, but then I quite like a smattering of fruit throughout the season, so we mixed up the June-bearers, day-neutrals, and ever-bearing varieties in the beds when we replanted this winter. The June bearers certainly come through on that all-at-once production though. Most large farms here treat strawberries as annuals, and till the fields over every year. I’m not nearly that ambitious though, and yes, pinching runners, for varieties that throw a lot of them, can really help divert that energy back into the plant for the following spring! Hi! Just curious what happened to all your animal husbandry content? I liked reading through all the info on chickens, turkeys, etc. Well, the animal rights activists have started to become more militant as of late and the city is starting to harass chicken owners (even though there are no laws on the books), so we’ve decided to lay low for awhile. I still have the content and once things simmer down I may start reposting it but for now I’m keeping it under wraps. If you have any questions regarding animal husbandry let me know. Thanks!